Several speculative writers (E. Stephen Burnett at Speculative Faith, for one) have been looking at the subject of magic from the vantage point of Christians trusting something other than God and His word in their pursuit of righteousness—including their efforts to controvert magic. As a result, some in this camp take a stand against speculative fiction, whether from a Christian or not, that includes magic. I’m convinced that those who would blackball a work of fiction for including magic are in the minority, but I don’t think it hurts to take another look at the subject. Here’s a reprise of an article that examines magic using the lens of the Bible. Some time ago I had a discussion with a Christian who considers much of speculative fiction to be opposed to the Bible. I’ve only had a few encounters with people who hold this view, though other writers have spoken of being surrounded by such folk. The exchange reminds me that it’s wise to confront this attitude head-on, with Scripture, starting with the fundamental question some ask: how does a Christian fantasy writer handle magic since magic is intrinsically un-Christian. But isn’t miraculous simply a more narrowed term, specifically referencing the divine? Magic, on the other hand, does not exclude the divine. However, I don’t want to get too caught up in semantics. Let’s agree that the Bible does warn against magic and witchcraft and other sorts of divination sought from powers other than God Himself. In contrast, God’s powerful works are called miraculous and prophetic. The point that is noteworthy for fantasy writers and readers, however, is this: the Bible makes it clear that both God and Satan have power. Not in equal measure. Satan is no more omnipotent than he is omnipresent, though I suspect he’d like Man to think he is both. Make no mistake. God’s power trumps Satan’s, and it’s not even a fair comparison. Satan may not get this because it seems he keeps trying to go up against God, as if he can outmaneuver Wisdom or out-muscle Omnipotence. Be that as it may, we can’t deny that he has power and it is supernatural—beyond Man’s abilities. Pharaoh had his magicians and so did Nebuchadnezzar, and seemingly they were used to these conjurers producing what normal folk could not. Their power was not from God, however. 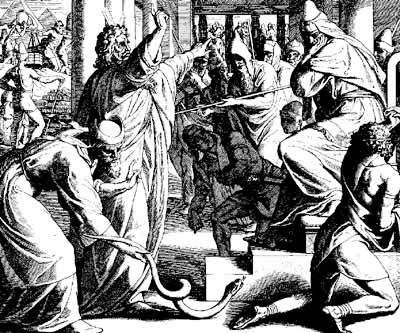 Moses, with the rod of God, went head to head with Pharaoh’s magicians, if you recall, and God’s power dominated. Nebuchadnezzar’s sorcerers could not tell their king his dream, let alone the interpretation of it, but God’s man, Daniel, could. But back to fantasy. If supernatural power—good and evil—is real, then why should Christian fantasy writers pretend that the evil forces in their stories don’t have real supernatural power? Why should we pretend that those siding with good have no supernatural power? Fantasy, after all, gives a story-long metaphor for the real world. Why would we want to give Christians—young adults or adults—the idea that there isn’t actually supernatural power of any kind by doing away with magic in our stories? It seems to me it’s important to address the source of power and the reality of power and the proper attitude toward power—all of which fantasy can address. Unless, of course, a Christian story must be scrubbed clean of supernatural power. This post is an edited version of one that first appeared here in 2010 and was republished in August 2013. Recently I had a discussion with a Christian who considers much of speculative fiction to be opposed to the Bible. I’ve only had a few encounters with people who hold this view, though other writers have spoken of being surrounded by such folk. The exchange reminds me that it’s wise to confront this attitude head-on, with Scripture. Some years ago Stephen Burnett recounted a question that came up at an ACFW Conference. Seems one of the conferees was asking how a Christian fantasy writer is to handle magic since magic is intrinsically un-Christian. Yesterday I introduced Books 1 and 2 of Sigmund Brouwer‘s Merlin’s Immortals series–The Orphan King and Fortress of Mist–as classic epic fantasy. The only problem is, one of the key fantasy tropes is … well, sort of missing. What we have is a fantasy with the promise of magic but no actual magic. The protagonist sets his sights to conquer a secretive, fortified city built by none other than the wizard Merlin and rumored to protect magical secrets. There’s the promise of magic. But throughout the story there is largely a scientific explanation for anything that looks to the people in the story as magic–potions, acid, technology, acrobatic trickery, scientific knowledge. It’s interesting, but I have to wonder if Mr. Brouwer is intentionally skirting the kind of magic the wizard Gandalf displayed in J. R. R. Tolkien’s books for fear of offending his Christian readership. I suppose I’ll never know. Still, I thought it might be appropriate to re-post my thoughts on magic from two years ago, largely answering the question, Is magic un-Christian? Here, then, is “Standing Up For Magic,” a re-do. It seems to me it’s important to address the source of power and the reality of power and the proper attitude toward power—all which fantasy can address. Unless, of course, a Christian story must be scrubbed clean of supernatural power. Have You Heard The Latest About Harry? It was a boring game, but the message got through — repeating a thing can change it, and we really shouldn’t believe what we hear when it’s a rumor. Some kids even intentionally changed the original phrase just to spice up the game. Others filled in gaps when they didn’t hear the whole message clearly, adding in their own thoughts so what they were passing along made sense. One way or the other, the original always changed. I think some adults need to play a round or two of Telephone. Today, with Internet chatter and email forwarded messages and Retweets, it is so easy to start a juicy bit of something going, and people believe it, often without challenging the veracity. I read it, they say, which makes it so. Or I heard it from my ___ (pastor, hairdresser, friend, spouse, co-worker, boss, or some other person in the know). Off we go, then, repeating a thing as if it is true when in fact we have no idea if someone someplace along the line of repetition didn’t misunderstand or intentionally change the message. How does this connect with Harry Potter? Once again, because of the recent release of the final Potter movie, Harry is making headlines. It seems some Christians are once more claiming untrue things about the books, movie, and author. As a result discussion is popping up on Facebook and on blogs at at media sites. Back in 2008, the watchdog site Snopes debunked a letter that was circulating about the evil influence of Harry Potter and how the books were drawing kids into the occult. It seems that much of the source material for the letter came from a satirical article meant to poke fun at the very ideas the letter embraced. In my article “Harry, Harry, Harry” I concluded that bad logic, an indifference to the meaning of words, or closed ears had to be behind a continued accusation of the occult against Harry Potter and his imaginative author. I’ll add one more likely possibility: people are simply repeating what someone else before then said — never mind that the message may be scrambled or completely made up. Why, after all, should we let a little thing like the truth spoil a good rant. And ranting against the occult gets attention. I remember when a pre-school director and her staff were mercilessly grilled in court and their entire school torn apart, the yard dug up, because they were accused of ritualistic Satanic abuse. Those people’s lives were destroyed, yet no evidence ever turned up and several witnesses later recanted their testimonies. We Christians should do better. It’s not a minor thing to accuse another person of involvement in witchcraft. For an influential television personality to do it despite evidence to the contrary, breaks my heart. After the last book came out in 2007, Rowling finally discussed the religious themes of the series. Witchcraft and satanism wasn’t part of the mix. Are the Harry Potter books Christian? I have no reason to believe they are. I have lots of reasons to believe they are not entwined with the occult. And it’s time Christians stop parroting uninformed bits of falderal, especial when it slanders someone else. Did we not learn what idle repetition does when we played Telephone? With the final Harry Potter movie at last in theaters, much talk has once again turned to how the stories about a boy wizard should be understood. Apparently there is a die-hard group clinging to the claim that the Potter books represent a threat. It seems there are two main criticisms. One claims that these stories about wizards advance the cause of the occult. A second claims that Harry behaves in such unrighteous ways, and receives the approbation of his elders in doing so, that he is no role model for young people. I’d like to consider each of these more closely. Does Harry Potter advance the cause of the occult? I’m no expert on the occult and have no desire to become one, but I do know that the description of sorcery and witchery in the Bible is not in Harry Potter. In the imaginative books, wizards have power but must learn to use it and control it (hence the school for witchcraft and wizardry). What is it the young people learn? How to fly their brooms, how to make their magic wands do what they want them to do, how to mix potions for desired magical transformations, and how to defend themselves against evil spells. The students are not taught how to bring up the dead or how to acquire more power from a spirit. As it turned out, the more the accusations were leveled at author J. K. Rowling and Harry Potter, the more Christian leaders spoke up to say the idea was false that the books advocated the kind of sorcery the Bible condemned. Ted Olsen, Christianity Today‘s online and opinion editor, put together an Opinion Roundup on the subject. Certainly there are pastors and others in Christendom who have spoken out against the Harry Potter books — I heard of another just last week. However, I have yet to hear anyone explain how books written as pretend, with no connection to genuine occult activity, still manage to teach the unsuspecting about the sorcery condemned by the Bible. That logic is inescapably bad. I can only surmise that someone holding this view cares little for the actual meaning of words or the context in which they appear. Or that they have not read Harry’s story and have closed their ears to all reason. I’ll look at the second major objection to Harry another day. In George Bryan Polivka’s Trophy Chase Trilogy, for example, the only “magical” element was the firefish, and that was enough. It was both mysterious and other—not of this world. I personally like more magic, not less. I wanted Gandolf to overcome the Balrog and the Hobbits to escape the Black Riders. I wanted the Ents to stir up the trees and the Elves to shield the Hobbits from the Orcs. I wanted the White Tree to provide Gondor with protection and Boromir’s horn to bring the help he needed. I wanted to warn Pippin not to look into the palantir. The more magic, the more intrigue. Anything can happen, and the reader is left equally to wonder and to worry because the best stories give magic to both sides. Intrigue leads to the next point. Fantasy that works also has a plot that works. Rule one for a good plot is, Create conflict. One of the things that kept me reading furiously through the last three Harry Potter books was the unpredictability. Was Snape good or evil? Would Harry be able to leave the Dursleys and go to live with Sirius Black? Would he win the Triwizard Tournament? Who was trying to kill him during the competiton? Why was he seeing such vivid visions of Voldemort? How would Harry find the horcruxes? And on and on. There’s still more, I think, so I’ll tackle those last elements another time. Monday being my regular blog day at Speculative Faith, I posted an article yesterday about magic (a reworking of three articles I’d first posted here at A Christian Worldview of Fiction nearly four years ago). One of the commenters (and fellow Spec Faith poster) Stephen Burnett recounted a question that came up at the recent ACFW Conference. Seems one of the conferees was asking how a Christian fantasy writer is to handle magic since magic is intrinsically un-Christian.